Jump Jive music can best be described as an exciting mixture of R & B, swing, rock'n'roll, boogie woogie and bllues. 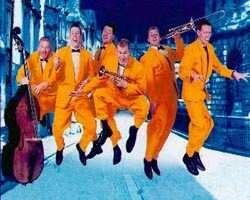 The JIVE ACES are the UK's top Jump Jive band. Since forming in 1989 this fully professional six piece group have starred in TV, radio, estivals, theatres, and numerous high profile events throughout Britain, Europe and the United States. They are renowned for their high-energy and spectacular stage show, combining a mixture of fresh arrangements of classics from the jive era - songs made famous by such greats as Louis "Five Guys Named Moe" Jordan, Cab "Minnie the Moocher" Calloway and ouis "Just a Gigolo" Prima - along with their own superb original Jive style numbers. These have gained them a large and enthusiastic worldwide following. They have played at countless major events including :- The Lord Mayor of London spectacular, Amnesty International shows, The Royal Ballet's 50th anniversary and numerous others, and at festivals such as City of London, Chichester, Cork, Cheltenham, Ly e Regis, Hemsby Rock 'n' Rol, and Borders Jazz to name but a few. Internationally they have played to tens of thousands in Norway, France, Switzerland, Austria, Spain, Germany, Italy, Holland, The Caribbean and the USA most notably as part of the 1996 Atlanta Olympic celebrations. They have appeared on TV from BBC1 to Monte Carlo to South America as well as dozens of yearly radio appearances. The Jive Aces have performed alongside many of the top names in the business, stars as diverse as John Travolta, The Count Basie Orchestra, Fairport Convention, NYJO, Jack Dee, Chris Barber, Kenny Ball and Buddy Greco.